Why has Pete Peterson’s expensive campaign against the deficit failed after more than 20 years? Why Peter Peterson and 20 years of anti-deficit campaigns have barely moved the needle. 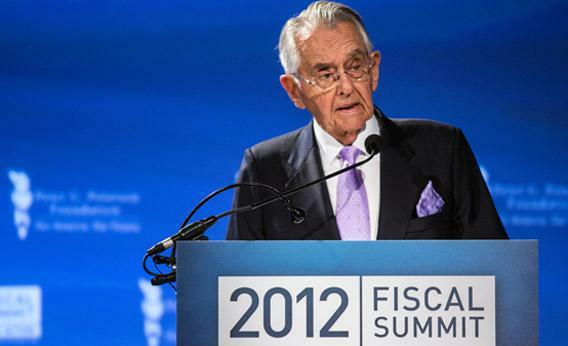 Pete Peterson, chairman of the Peter G. Peterson Foundation, at the 2012 Fiscal Summit on May 15 in Washington, D.C.
Photo by Brendan Hoffman/Getty Images. For a few months, the upstarts at The Can Kicks Back tried and failed to go “viral.” This was predictable. The “viral video” should be an unpredictable beast. People like what they like, and Tumbl what they Tumbl. But there’s a whole industry of people paid to schlep wacky things to Internet Thought Leaders. The Can Kicks Back—its name is meant to evoke the proverbial MacGuffin that gets “kicked down the road”—tried video interviews and got 100-odd YouTube views. It tried a visit to the Hill by a 23-year-old staffer dressed as a giant can. That earned around 3,000 views. People couldn’t get enough of Dancing Simpson. The performance was “both merry and shrewd,” according to Peggy Noonan. Simpson, whose emeritus role chairing the president’s debt commission gets him plenty of free media, got even more. In the tangled and expensive world of professional austerity campaigns, this was the first media breakthrough in months. It was a little bit sad, and a bit more revealing. For 20 years, a coalition of wealthy people—Pete Peterson chief among them—has spent hundreds of millions of dollars to build public support for austerity. They have held annual summits, then semiannual summits. They’ve written books. They’ve started up coalitions. They’ve partnered with MTV. It’s been five weeks since Barack Obama was re-elected, and there’ve been two gatherings in downtown D.C., put on by Peterson-tied organizations, asking politicians to do something about that debt. But do what, exactly? Here’s the current problem with Peterson-ism: As scary as it seems to liberals, as clear as it may be that Peterson wants to build momentum for entitlement cuts, the actual work of these groups has moved us no closer to those said cuts. And it’s had quite some time to try. The modern era of anti-deficit pressure campaigns began in 1992. Democrats, at that time, were the party that panicked over budget deficits, warning voters that these shortfalls would bankrupt the entitlements they loved. Ross Perot’s campaign for president was predicated on “shared sacrifice” to cut the then-$4 trillion debt. When Paul Tsongas quit the Democratic primary, he joined Peterson to found the deficit-hawkish Concord Coalition, up and running when Bill Clinton won the presidency. After the election, Greenberg-Quinlan released a complicated poll of public attitudes on deficit fixes. One thousand and one voters were given a menu of budget items and asked whether to cut them or increase them, and by how much. Voters were ready to hike taxes on pollution by 225 percent, on alcohol by 33 percent, and on corporations by 18 percent. They wanted massive cuts to foreign aid (35 percent), nuclear weapons (27 percent), and defense (17 percent). But they wanted to increase spending on Social Security and Medicare by 1 percent. Five years later, Clinton was presiding over a balanced budget and a smaller public debt. The professional deficit hawks responded by switching up their messaging—instead of an immediate fix to a current crisis, they wanted a fix to a looming crisis. The permanent class of austerity campaigners evolved, and grew less relevant. By 2004, Peterson was telling Businessweek that “the Republicans have become a far more theological, faith-directed party,” with no concern for what they were doing to the deficit. But by February 2008, he was seeding the Peter G. Peterson Foundation, a media-savvier reboot of Concord (which is still alive and kicking). Thus began a bold, big-spending new era of austerity campaigns. The Peterson Foundation joined Concord, which joined the Committee for a Responsible Federal Budget, whose president Maya MacGuineas had joined the New America Foundation, where she often found herself on the side of the Peterson-supported Committee for Economic Development. In 2010, the Peterson Foundation funded a national awareness tour on the need for entitlement cuts and ran ads touting a foolish phony presidential candidate who wouldn’t cut anything: “His favorite period in American history was World War II, when America’s debt level reached its peak of 122% of GDP.” In 2011 and 2012, the former U.S. Comptroller General David Walker—a Peterson ally and former Peterson Foundation head—almost became a real presidential candidate. He offered his services to the theoretical supporters of Americans Elect, a $35 million effort to re-create the Perot magic by putting a third party on the ballot. There were less gimmicky ideas. Every year, starting in 2010, the Peterson Foundation gathered powerful Washingtonians for “fiscal summits.” Starting in 2011, it appealed to left-right think tanks to come up with long-term budget plans. They diverged wildly, as you’d expect when you ask the Roosevelt Institute and the Heritage Foundation to independently solve the same problem. But in its 2011 progress report—one of the most deliriously optimistic documents of this kind—the Peterson Foundation pointed out that “their plans showed a remarkable consensus on several key priorities,” and that the ball had thus been moved downfield. Whether that makes any sense whatsoever, you can appreciate how much it cost. According to Ryan Grim and Paul Blumenthal, Peterson’s four-year commitment to his new foundation totaled $458 million. They made those calculations before this summer, when two new Peterson-aided groups emerged—Fix the Debt and The Can Kicks Back. The latter group was actually co-founded by a veteran of the David Walker presidential campaign. The former rebooted the Concord Coalition model by signing up Democrats, like former Pennsylvania Gov. Ed Rendell and Los Angeles Mayor Antonio Villaraigosa, to make common cause with 80 CEOs. The new-new deficit hawk campaigns managed to spook liberals anew. The Fix the Debt campaign became an immediate presence on cable news, set up meetings with the president, and scheduled a post-election conference—chaired by Maya MacGuineas. But when, exactly, was one of these “education” campaigns supposed to pay off? This August, nearly 20 years after that blockbuster Greenberg-Quinlan poll, the Associated Press-GfK poll asked voters how they preferred to fund Social Security. Did they want a benefit cut or a tax hike? The tax hike won out, 53 to 36 percent. Walker sat down as Sen. Max Baucus, chairman of the finance committee, rose to give his speech. Half of the text consisted of football analogies. The other half reiterated the Democrats’ desire to raise the top tax rate and raise the debt limit with no strings—and to defend entitlements by attacking health care costs, not payouts. “Shifting costs to seniors is not the solution,” said Baucus. It sounded like Peterson et al had constructed a Trojan horse, then failed to pay attention as the Greeks piled inside. During a break, I went to grab water at the conference’s breakfast table. Also grabbing a water, bypassing the complimentary coffee cake, was Alice Rivlin. The former OMB director, a veteran of the Obama era’s major fiscal task forces, wanted to know whether I’d seen the protests.